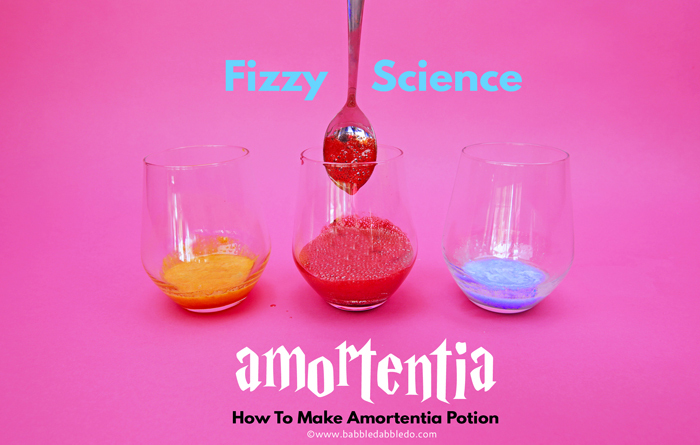 Welcome to potions class my young witches and wizards…today we are going to make Amortentia, the most powerful love potion ever…Are you ready to fall in love? When Romilda Vane tried to lure Harry into eating a box of chocolates laced with Amortentia she didn’t realize they might be eaten by someone else! 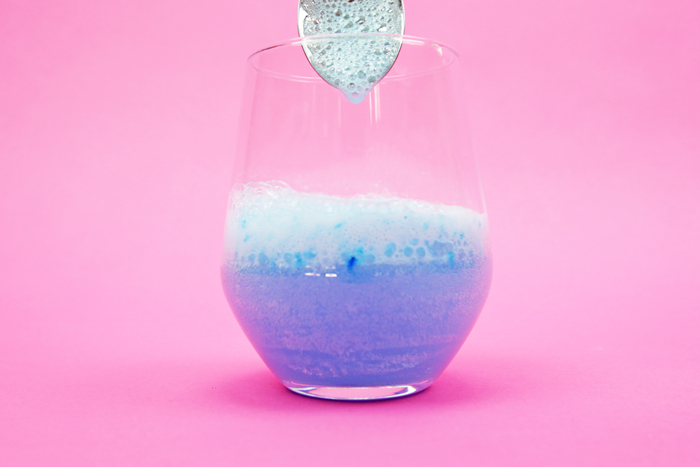 So take heed young students and be sure this potion ends up in the right hands… Today’s potion is actually a fizzy science experiment for kids exploring the reaction between citric acid and baking soda! The best part? 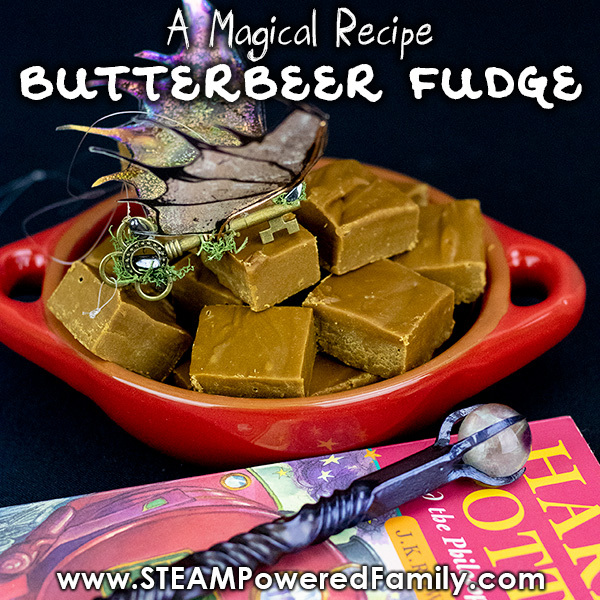 This “love potion” is safe to taste…but beware, you must have a serious sweet tooth to handle it’s potency! 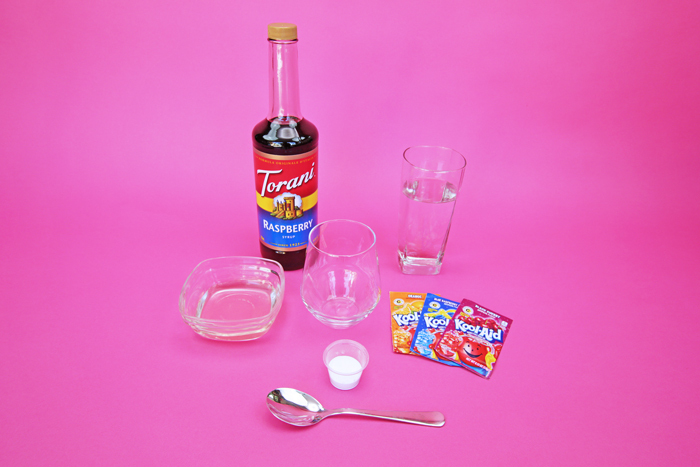 If you can’t find Torani syrup at your local grocery store make your own simple syrup. In fact simple syrup is an excellent demonstration of how solids dissolve when heated. Please note: This must be adult led/supervised and can be prepared ahead of time. Step 1 Add 2 cups of sugar and 1 cup of water to a saucepan and stir. Step 2 Bring to a boil and then reduce heat and simmer for 5 minutes. Step 3 Let cool and store in the refrigerator until ready to use. 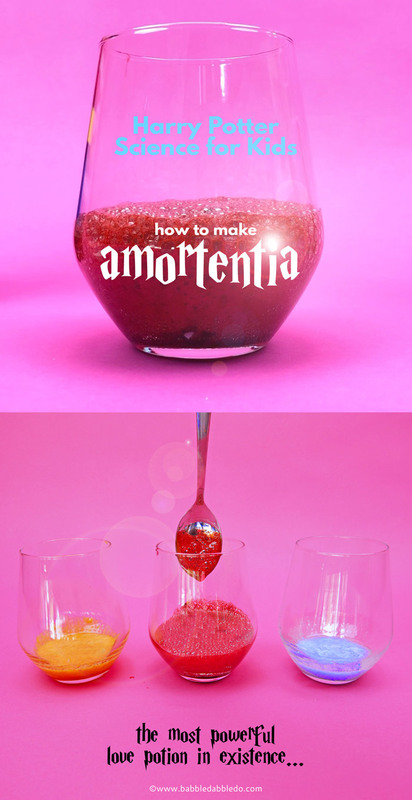 This recipe is for one serving of Amortencia and can made be made in individual glasses. Step 3 Add 2 Tablespoons of simple syrup or Torani flavored syrup to your glass.Stir to combine. Step 4 Let sit for 1-3 minutes. The mixture will begin to foam and expand in size. Step 5 Add ½ cup of water and stir. Add more water to taste if the drink is too sweet for you. Bestow this upon the person whom you wish to fall madly in love with you…unless they hate sweets! Now I have to admit this is SUPER sweet…you may need to adjust the amount of water to taste. If you are looking for a slightly tangy-er and less sugary concoction substitute food grade citric acid for the Kool-Aid. It actually has quite nice sour punch to it! Note: Baking soda is salty! Don’t add to much or your amour will spit this out across the room! If however you aren’t intersted in drinking this but would rather see a fantastic chemical reaction occur, go ahead and add a lot of baking soda! 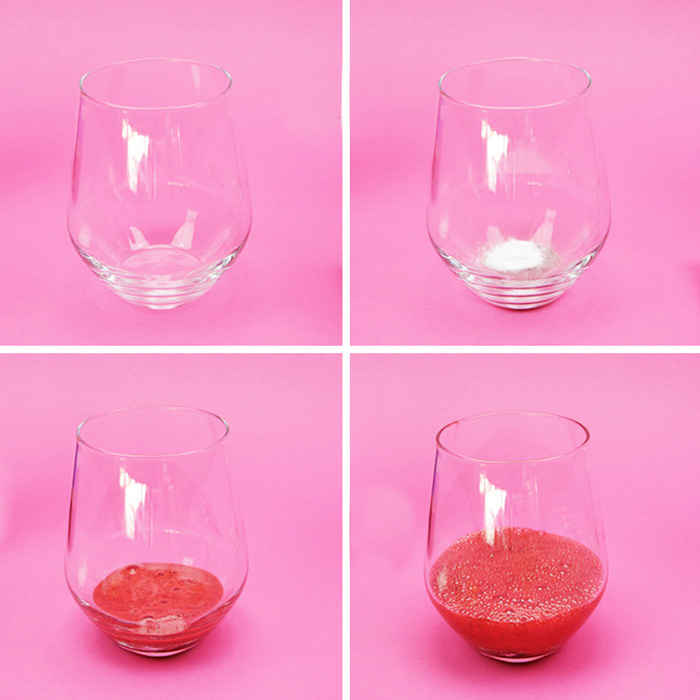 And have a tray underneath your glass to catch the foam! Kool-Aid contains citric acid, an acid that naturally occurs in citrus fruits like lemons and limes etc. An industialized form of citric acid is actually made from a mold called Aspergillus niger and is used in food products like sour candy, Kool-Aid, and soft drinks. When baking soda (sodium bicarbonate) is mixed with citric acid a chemical reaction occurs and the byproduct is carbon dioxide, a gas, which is why it begins to bubble. Notice however that the reaction does not occur until the the citric acid and baking soda are moistened allowing their molecules to react with each other. When you first mix them together as dry ingredients, nothing happens but with the addition of the liquid syrup a slow chemical reaction begins to occur. Add in the water and it further speeds up the the reaction!